We are excited to announce our fourth book in the 365 Series was released on November 14, 2017. 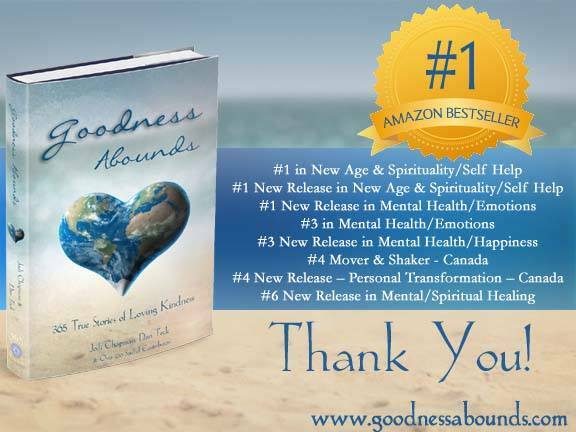 It’s called Goodness Abounds: 365 True Stories of Loving Kindness. It is a collaborative book compiled by Jodi Chapman & Dan Teck.Jerri’s Featured Piece is called, “The Baby and the Bus Driver.” Jerri returned to college when Marcus was only 10 days old. Her mom agreed to watch Marcus for spring quarter…but Jerri had to take the city bus at 6:30 a.m. to get across town to her mother. Gretchen’s Featured Piece is Called, “A Miracle in the Parking Lot.” Divine synchronicity and goodness abound in mysterious ways as you read about the true story of a parking lot birth with a surprisingly delightful twist. Now, more than ever, we feel that it’s so important to look for – and FIND and CELEBRATE – the many examples of good-hearted people expressing kindness…every day, in endless ways! This book will include 365 true stories (from over 250 contributing authors) of people expressing love, goodness and kindness. The experiences will range from huge expressions of lifelong love (such as caring for a child or aging parent with severe challenges) to small acts of kindness (such as complimenting a stranger) – all sharing one thing in common: they add to an ever-growing mountain of evidence that goodness abounds! It’s our hope that when someone picks up this book, they can flip to any page and find a true-life story that will provide inspiration and encouragement to reflect upon the kindness they’ve experienced in their own life…and to be on the lookout for more!